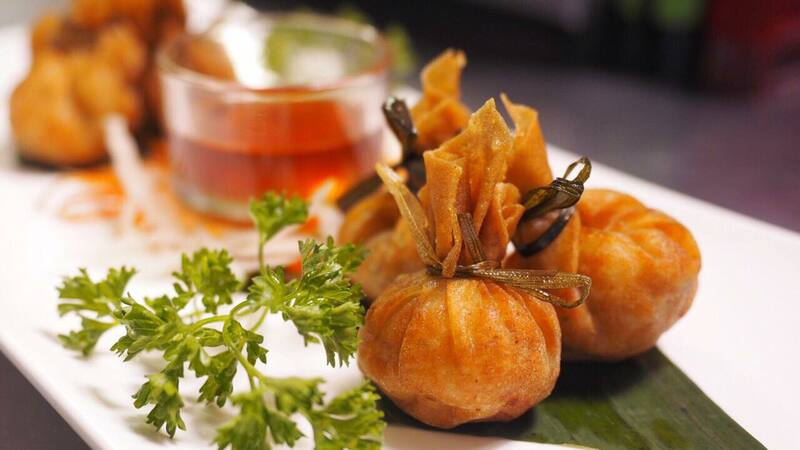 "Thung Tong" are delicate little wrapper filled with combinations of chicken, shrimp and mixed veggie. Deep fried to perfection. Homemade Chicken Wontons in light chicken broth with bok choy, Scallion, Cilantro, fried garlic and a dash of ground white pepper. 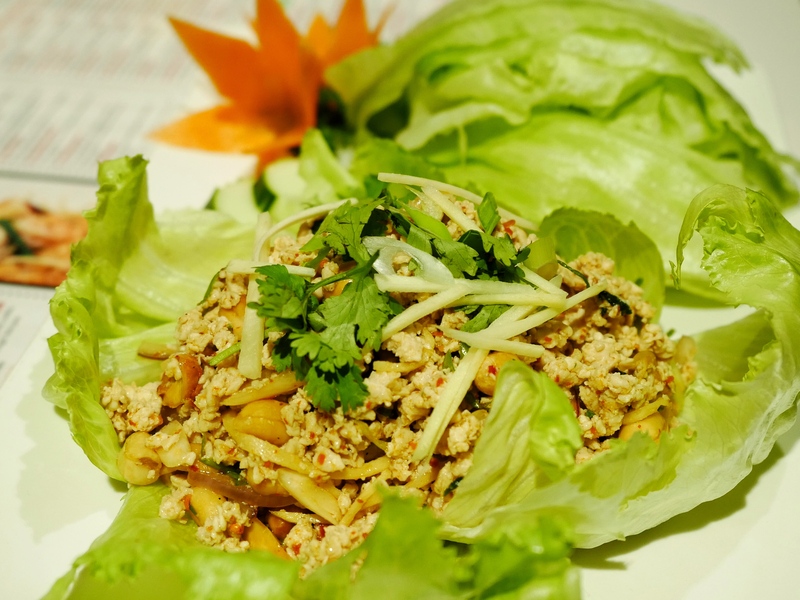 Flavorful ground chicken in spicy special sauce. Served with fresh lettuce. steamed salmon wrapped with savoy cabbage topped with our famous home-made green curry sauce. Served with Asparagus, String Bean and Broccoli. 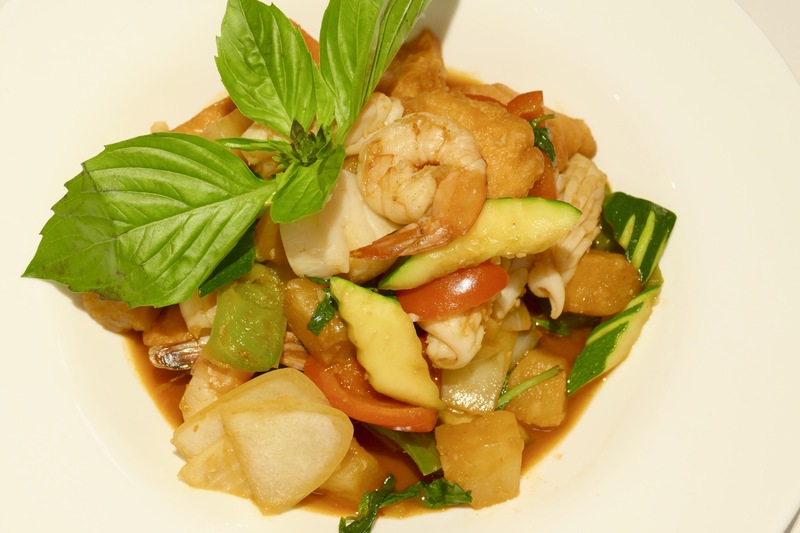 Seafood stir fried with bell pepper, onion, zucchini, pineapple, carrot and basil in special spicy sauce. 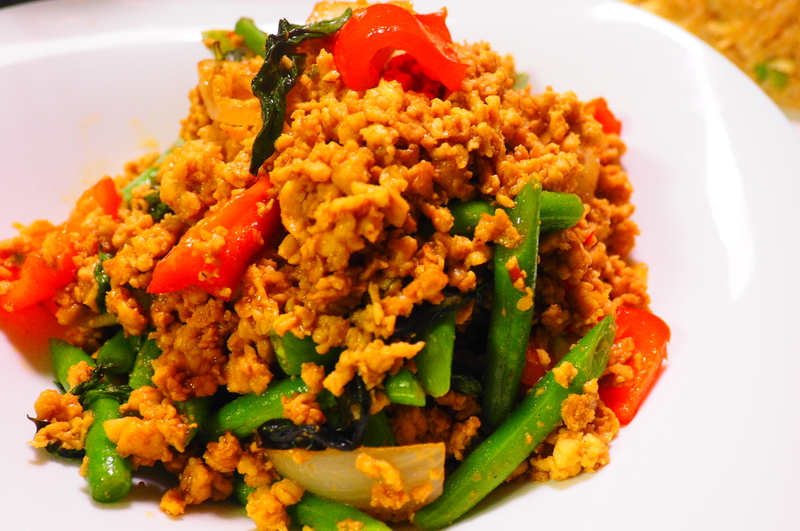 Stir-fried ground chicken, garlic, onions, green beans, bell peppers, in Thai Basil chili sauce. 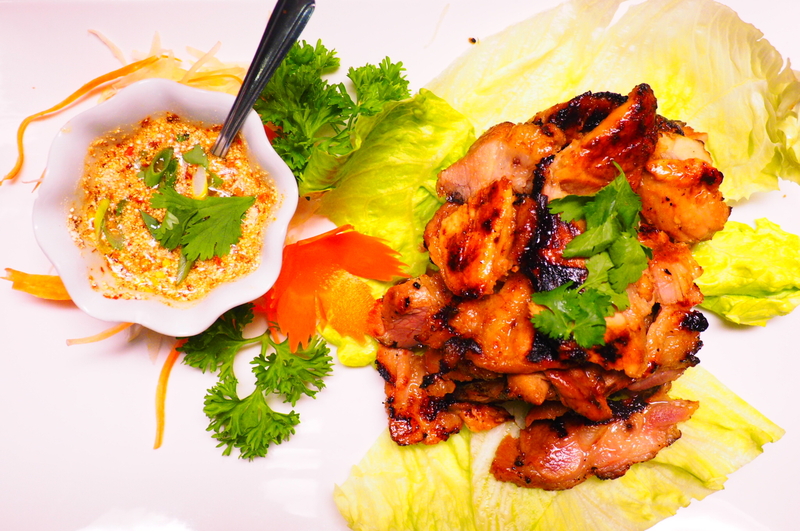 Grilled marinated pork with Thai spicy chili sauce. Served with sticky rice. Steamed fresh mixed vegetables topped with grilled chicken. Served with Thai dressing and peanut sauce. Stir fried salmon in Panang curry paste, sting beans, snow pea, bell peppers. 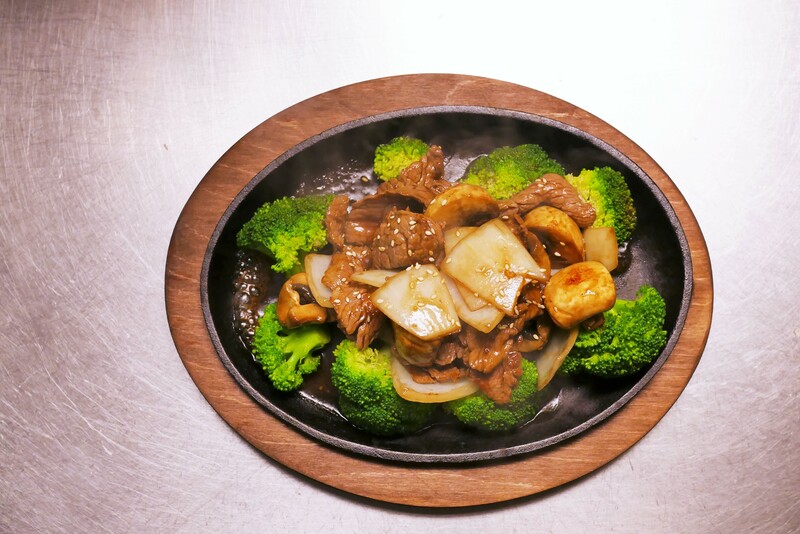 stir fried slice beef with mushroom, onions, broccoli in sesame sauce. 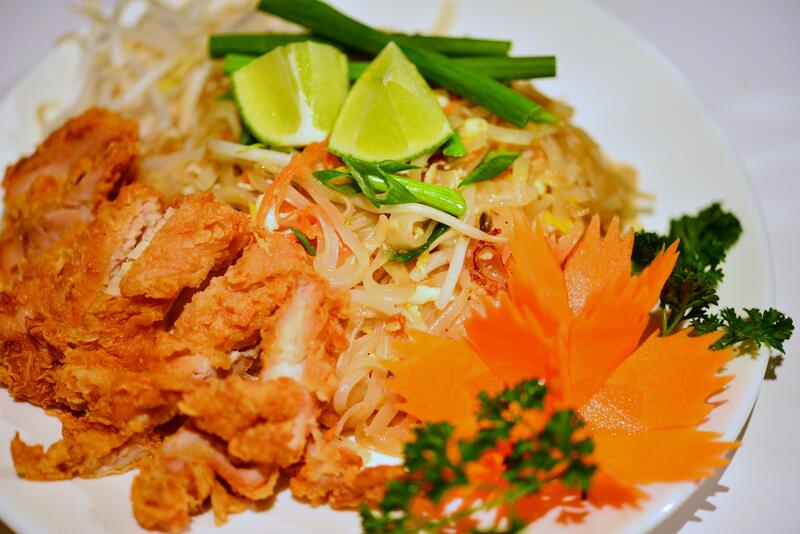 Deep fried marinated chicken or Deep fried duck, served over Phad thai noodles. 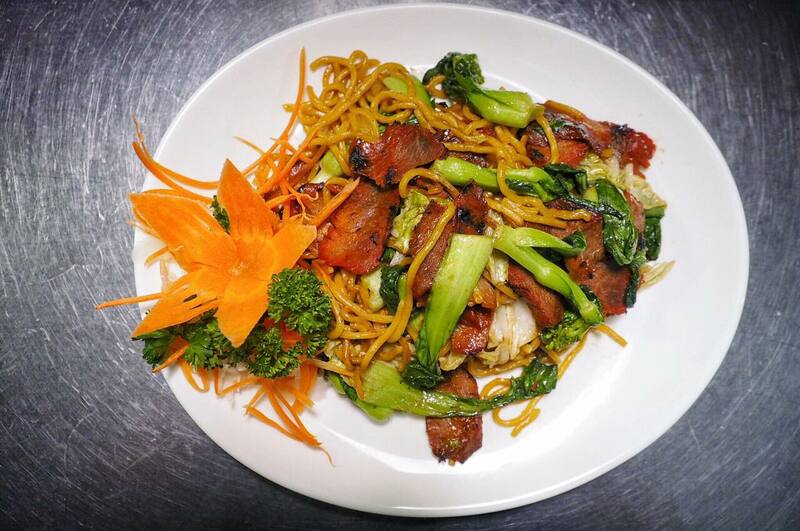 Choice of egg noodles or rice noodles with sliced roasted pork, beansprout and bok choy in clear broth. The varieties of 2 Shumais, 2 Crab rangoons, 2 Chicken Satays, 2 Fresh Rolls, and 2 Blanket Shrimps. 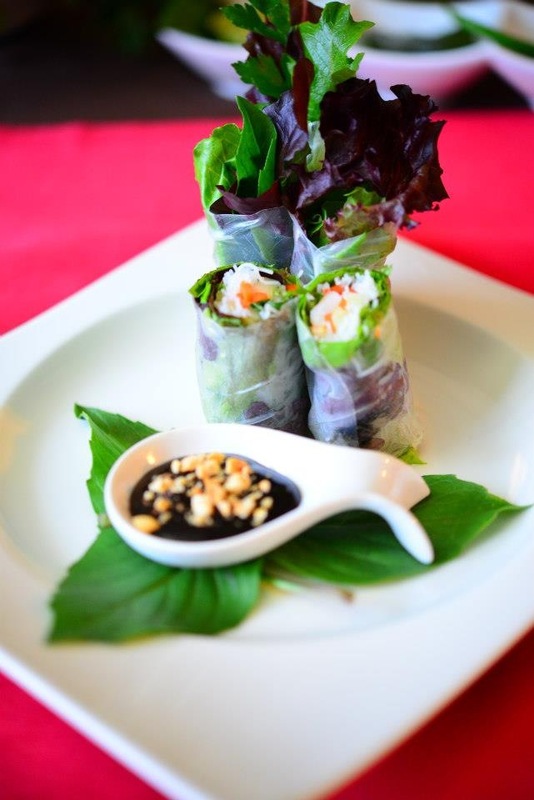 Soft rice paper wrapped with fresh vegetables served with house sauce topped with ground peanut. Grilled tender chicken breast on a skewer. 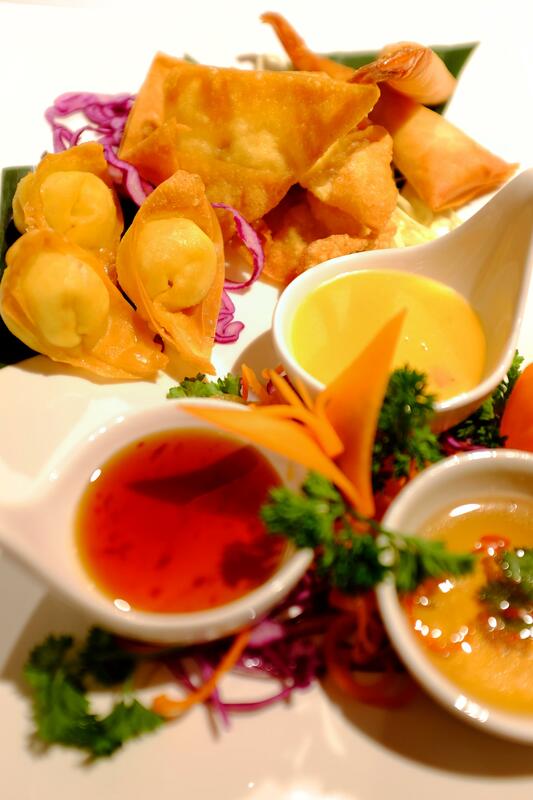 Served with Thai traditional peanut sauce and cucumber sauce. Stuffed shrimp, chicken, shitake mushroom, bamboo shoots, water chestnuts. Served with sweet soy sauce. 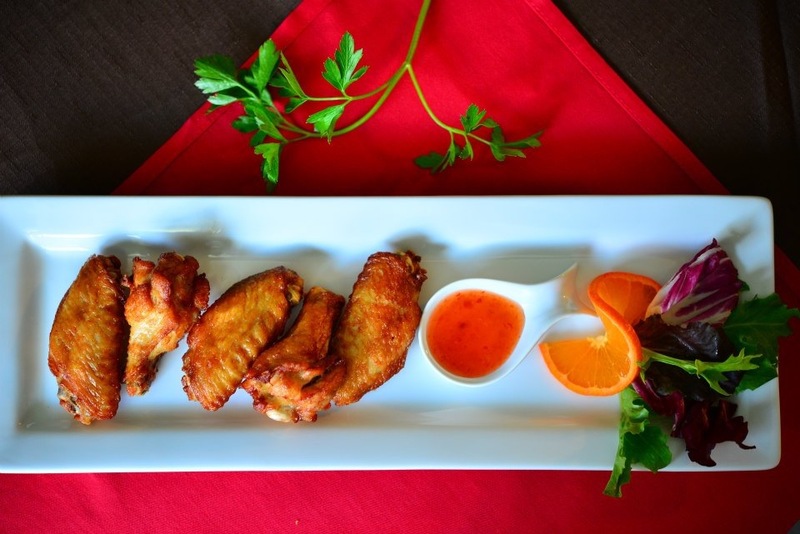 The crispy Thai style marinated chicken wings served with sweet chili sauce. Homemade wonton filled with crabmeat, cream cheese, celery and carrot. Served with house Mayo sauce. Thai style golden-fried shrimp in coconut flake batter. Served with sweet and sour sauce. Grilled shrimp and squid. Served with Thai chili sauce. Stuffed potatoes with curry powders. Wrapped in a pasty puff and lightly deep-fried. 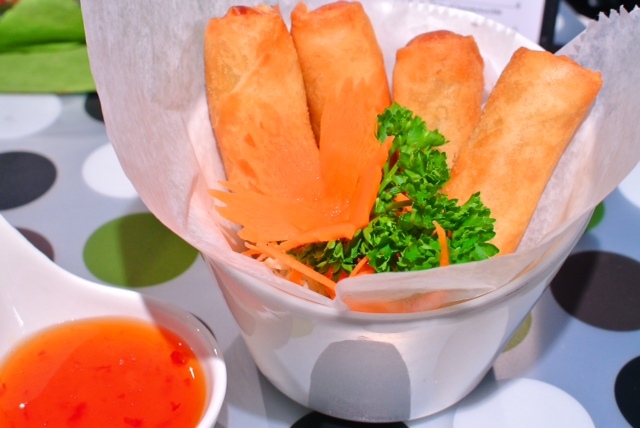 Crispy fried vegetable rolls served with sweet and sour sauce. Crispy fried tofu served with sweet and sour sauce topped with crushed peanut. Pan fried flatbread. Served with curry sauce. Chicken and vegetable dumpling. Served with soy sauce. The famous Thai spicy soup made with lemongrass, kaffir lime leaves, mushroom, lime juice, scallion and cilantro. The traditional coconut milk soup with lemongrass, kaffir limes leaves, galangal, scallion and cilantro. Thai spicy and sour soup with mixed seafood, cod fish, lemongrass, kaffir lime leaves, galangal, lime juice, fresh basil and crushed chilies. Homemade rice soup with your choice of meat. A Thai breakfast classic that is great all day long. The Thai‘s famous spicy green salad with fresh lime juice, green beans, tomatoes and peanuts. 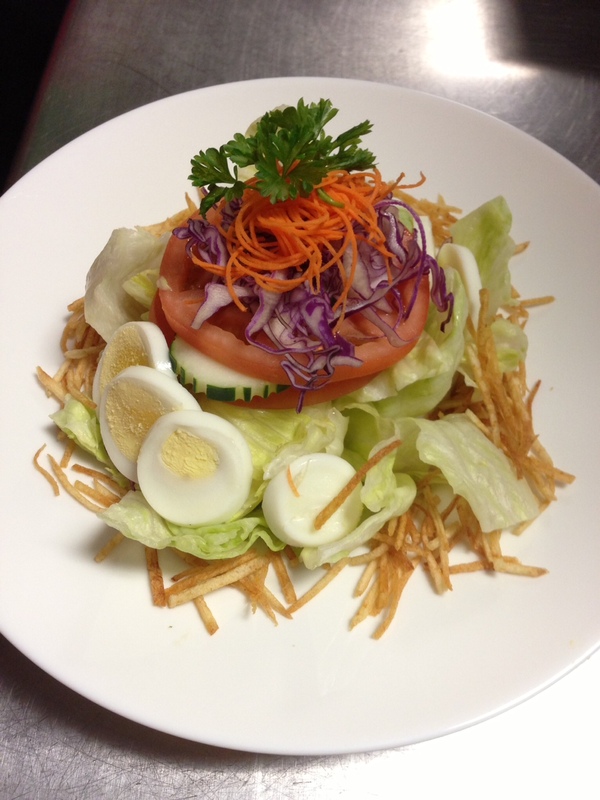 Mixed vegetable of lettuce, carrot, cucumbers, tomatoes, eggs and crispy potato. Served with Thai peanut dressing. Combination of shrimp, squid, and scallops mixed with fresh lime juice, fish sauce, crushed fresh chilies, onion. Served with fresh lettuce. 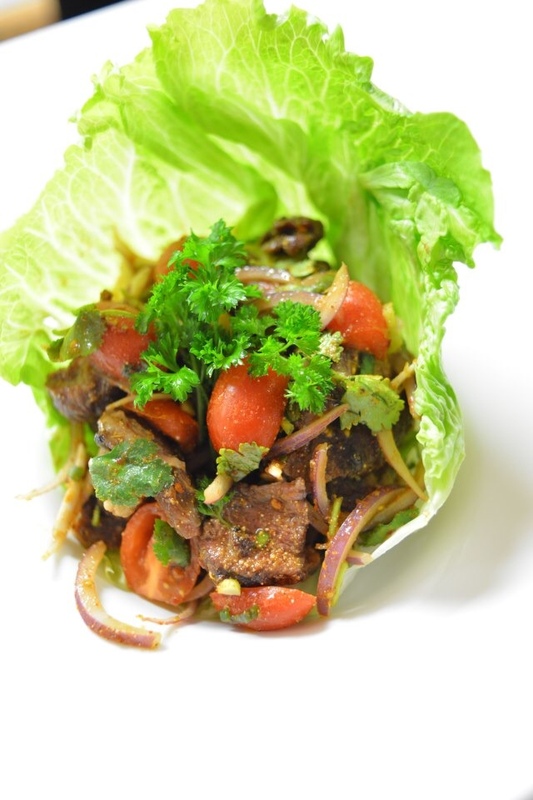 Sliced grilled beef seasoned with fresh lime juice, red onion, scallions, tomatoes and cucumber. Your choice of chopped chicken or pork tossed in Thai lime dressing with red onions, hot chili peppers, cilantro, scallion and roasted rice powder. Grilled shrimp seasoned with chili paste, lemongrass, fresh lime juice, fish sauce, scallions, cilantro and red onions. Sliced crispy roasted duck, cashew nuts, tomatoes, pineapple in chilies lime sauce. The most famous Thai rice noodles stir-fired with eggs, bean sprout, scallion and crushed peanuts. Stir-fried wide rice noodles with chilies, onion, red and green bell pepper, carrot, egg, basil and scallion. Stir- fried wide rice noodles with sweet soy sauce, eggs and Chinese broccoli. 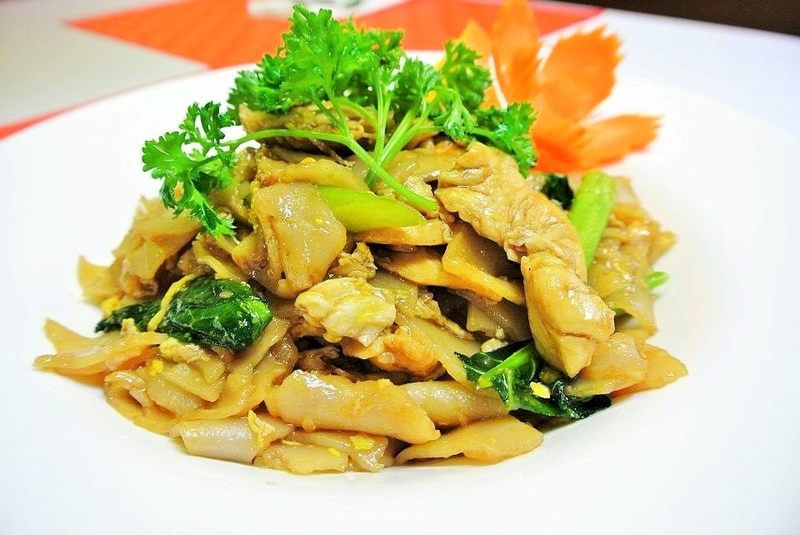 Stir-fried wide rice noodles or crispy egg noodles with Chinese broccoli, salted soybean topped with Thai gravy. Stir- fried bean thread noodles with Napa Cabbage and egg in Thai suki sauce. Choice of Chicken, Beef, or Duck in Pho broth, onions, scallion. Served with fresh bean sprout and basil. Egg noodles in red curry broth with seafood, basil and bean sprout. Thai spicy rice noodles soup with mixed seafood and bean sprout. Thai style fried rice with egg, onions, tomatoes and Chinese broccoli. Southern Thailand style fried rice with flavors curry sauce, pineapple, raisins, egg and cashew nut. Thai spicy fried rice with bell pepper, egg, onions and fresh basil. 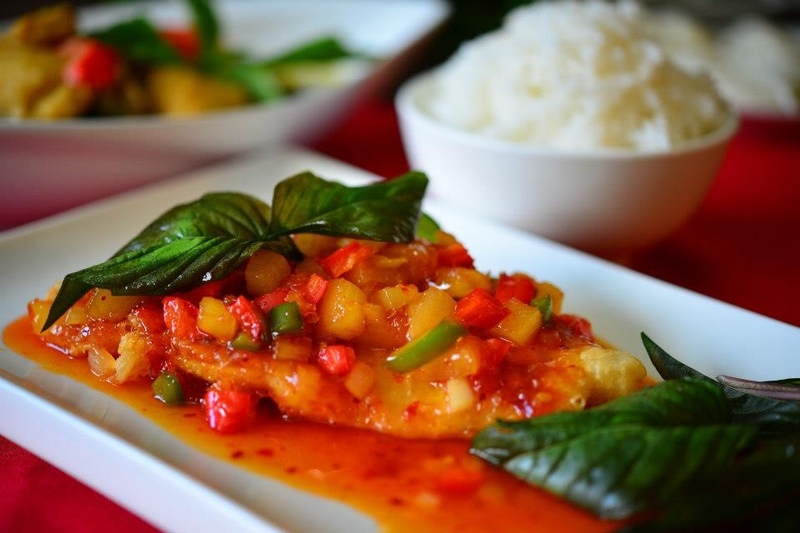 Sautéed with Panang curry paste, coconut milk, sting bean, bell peppers and fresh basil. 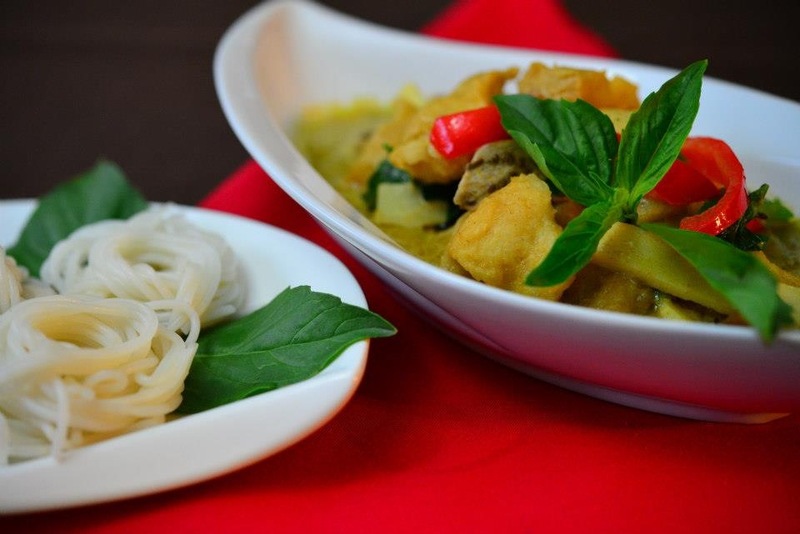 Spicy green curry with coconut milk, sting bean, bamboo shoot, eggplant, bell peppers and fresh basil. Red curry with coconut milk, bamboo shoots, eggplant, bell peppers and fresh basil. Mild Massaman curry with coconut milk, peanuts, onion and potato. Non- coconut milk with wild ginger, peppercorn, sting bean, baby corn, sting bean, mushroom and bell peppers. 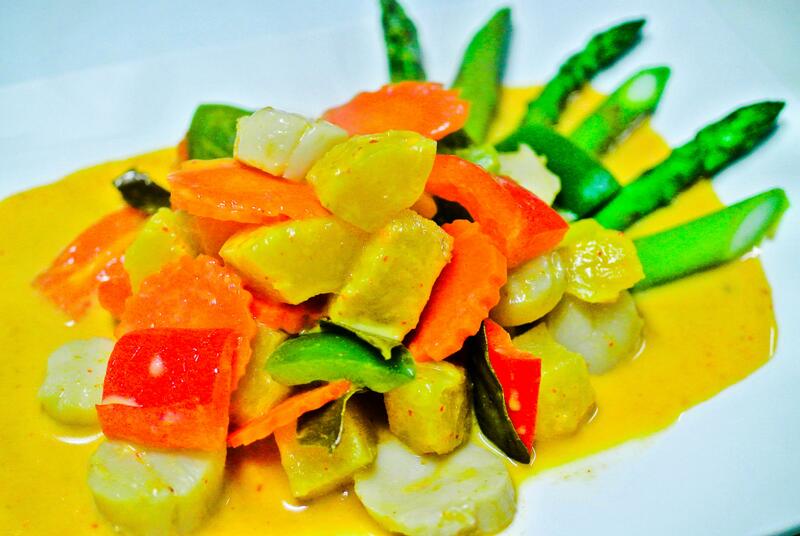 Yellow curry with coconut milk, potatoes, onions and cherry tomatoes. 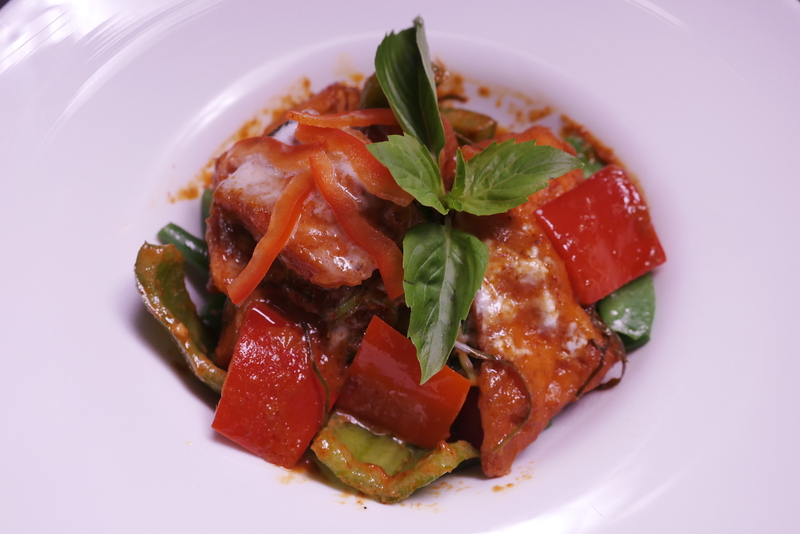 A spicy Thai dish with flavors of hot chili sauce, fresh basil, mushroom, onion and bell peppers. Sautéed with oyster sauce, fresh ginger, shitake mushroom, snow pea, carrot, celery, onions and bell peppers. Sautéed with Thai roasted chili paste, snow pea, sting bean, onions, basil and bell peppers. Sautéed with fresh garlic sauce and served over fresh lettuce. 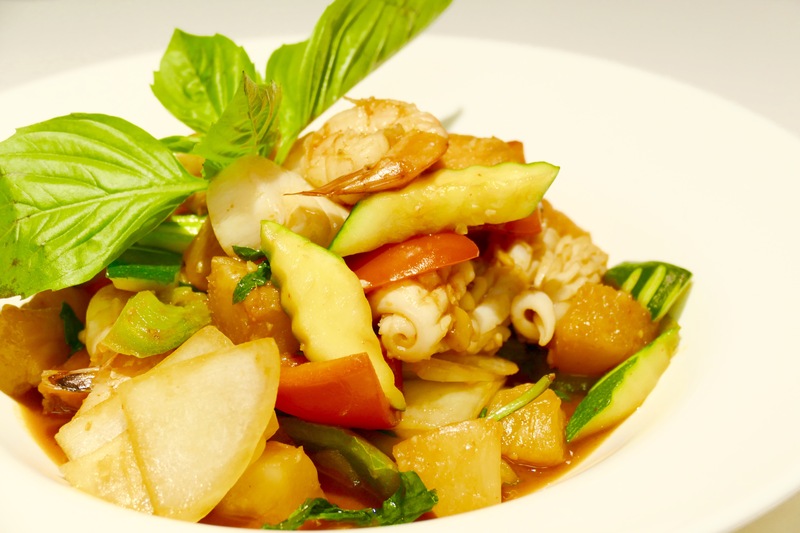 A sweet and sour Thai Style with pineapple, onions, tomatoes and cucumber. A spicy eastern Thai style chili sauce. Sautéed with vegetables. Green beans stir-fried in red curry paste with kaffir lime leaves. 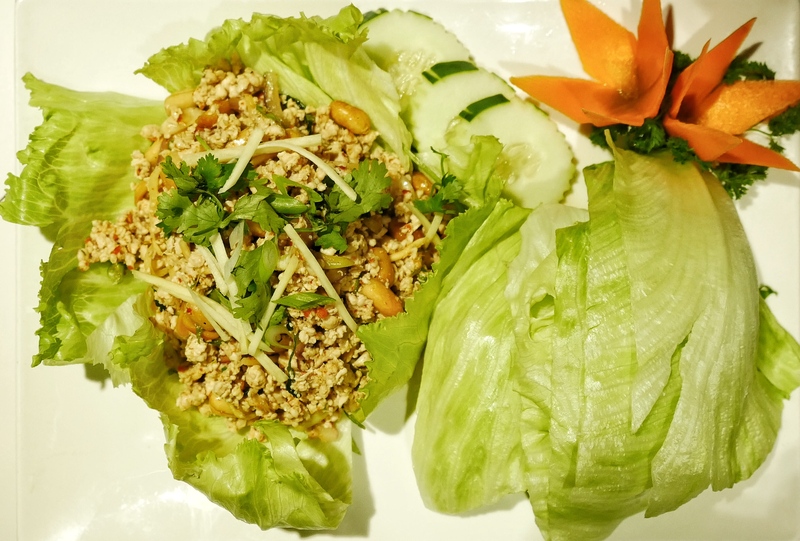 Sautéed with ground chicken, fresh minced hot pepper, basil leaves, sting bean, bell peppers. Rice vermicelli or whole-wheat spaghetti tossed with fresh spring mix and shrimp. Served with chili lime sauce. Sautéed with oyster sauce, garlic and mixed vegetables. Sautéed with asparagus, Chinese eggplant, bell peppers, basil and pickled soybean. 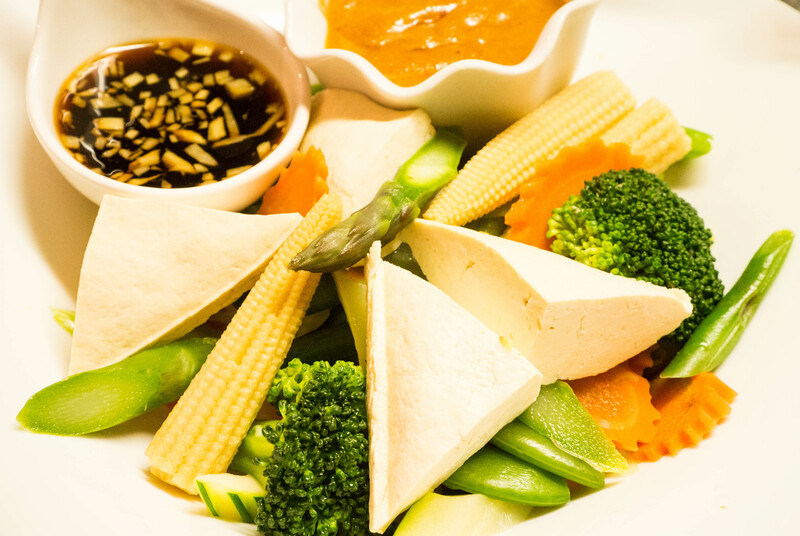 Steamed fresh mixed vegetables, tofu. Served with Thai peanut sauce and ginger sauce. 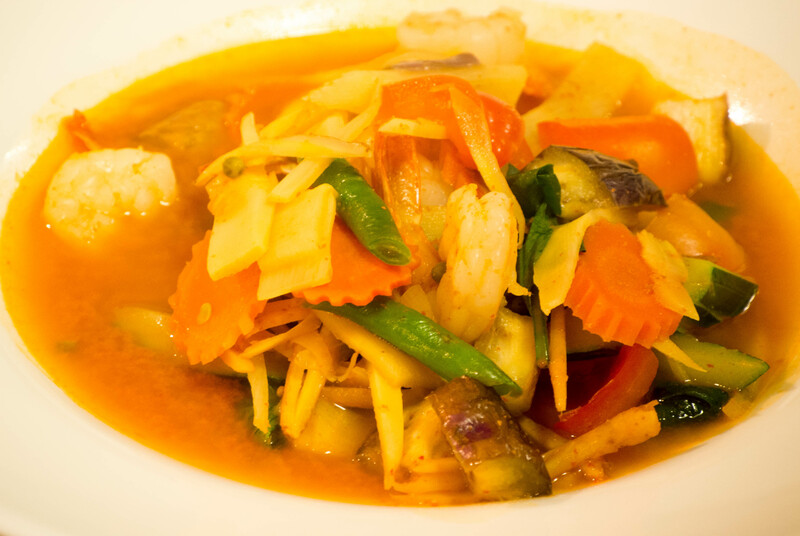 Jumbo shrimp sautéed with garlic, fresh asparagus and carrot in shrimp paste sauce. Stir-fried Brown rice with fish tofu or shrimp, red onions, tomatoes, Thai Herbs in a tom yum paste. Stir fried celery, onions, and bell peppers in a Thai yellow curry sauce. Sautéed shrimp, squid, mussel with fresh chili, basil, garlic, peppercorn, and wild ginger in red curry paste. Stir fried large prawns with fresh garlic and white pepper. Sautéed King crab, shrimp, squid, mussel, scallops, pineapple, zucchini, cashew nuts with roasted chili paste. Shrimp or Duck with zucchini, onions, bell peppers, fresh mango in Thai yellow curry. Sautéed sliced roasted duck, vegetables, pineapple and cashew nut with Thai spicy chili sauce. 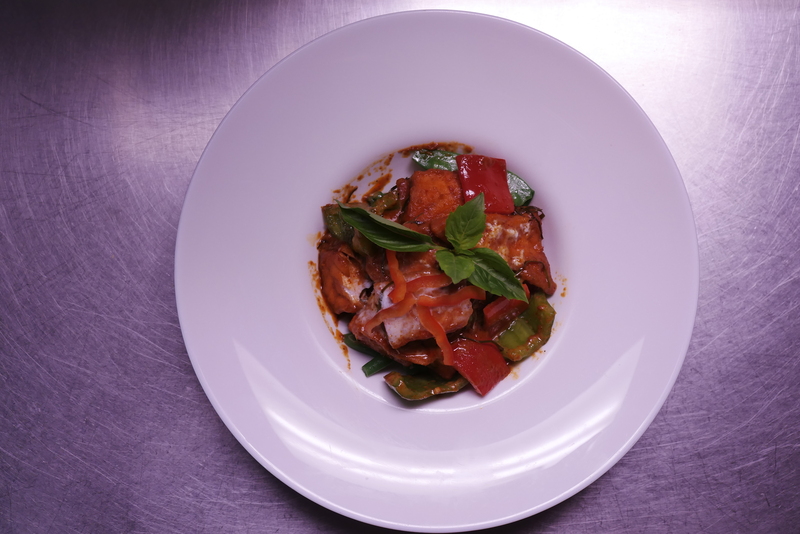 Sliced roasted duck simmered with coconut milk, cherry tomatoes, pineapple chunks and basil in red curry. 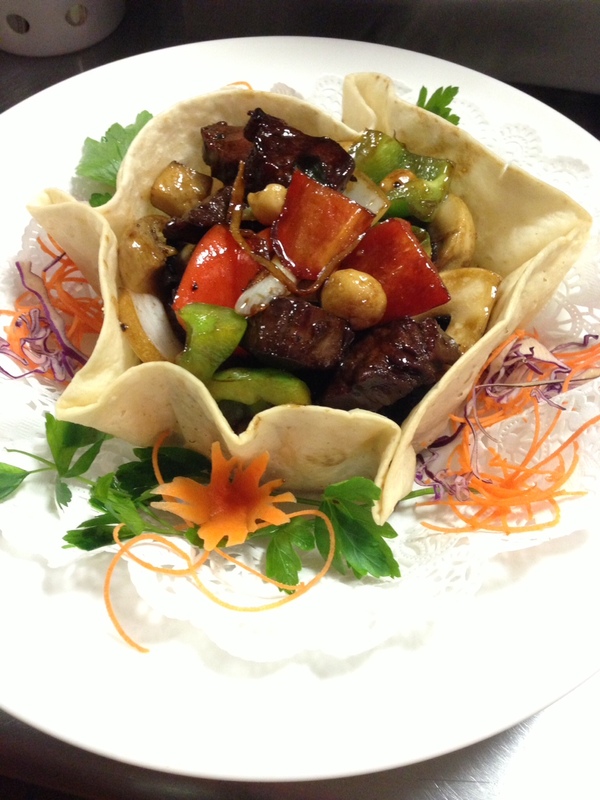 Marinated tender beef sautéed with fresh ginger, pepper and macadamia nuts. Served on bed of sautéed spinach in tortilla shell. Grilled Salmon over signature Panang Curry, snow pea, baby corn, basil, bell peppers. Served with fresh avocado. 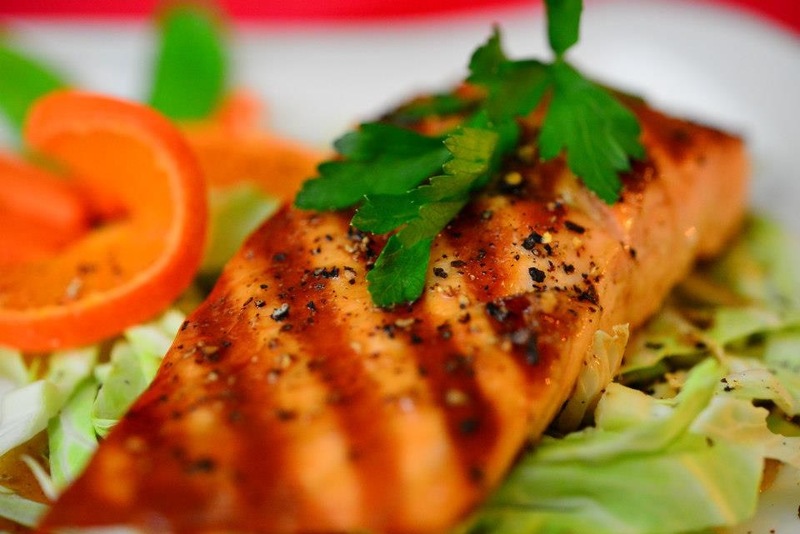 Grilled salmon in black pepper sauce. Served with fresh carrot and snow peas. Crispy fried fillet fish. Topped with three favors sauce, onion, bell pepper and basil. Steam fillet fish with fresh ginger, sesame oil, and shitake mushroom in Thai soy sauce. Half boneless crispy duck with tamarind sauce. Served with fresh broccoli, bok choy and carrot. 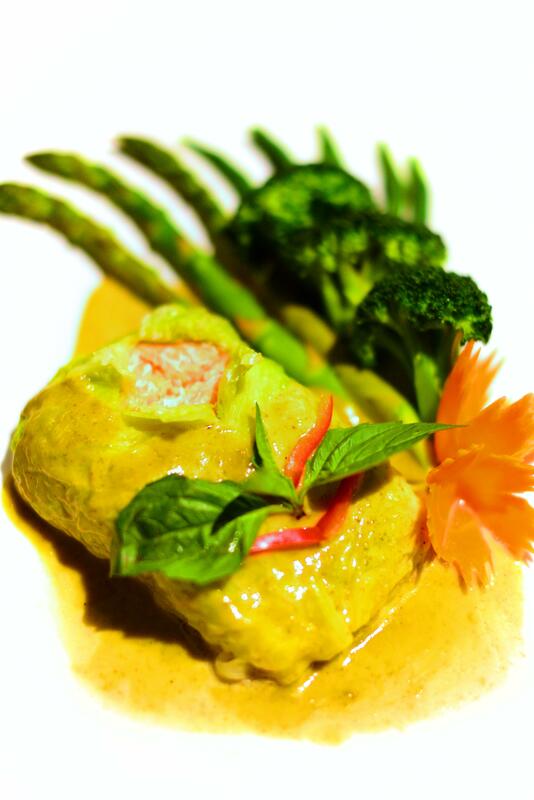 Our delicate fillet fish in green curry. 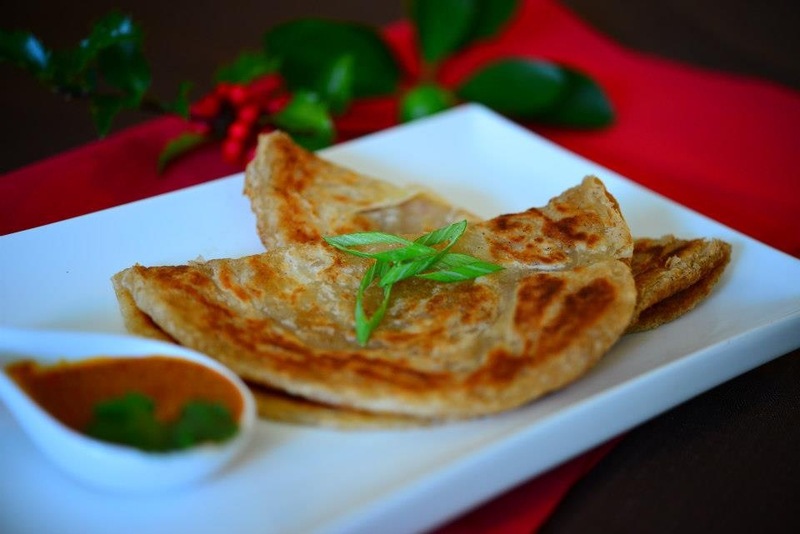 Served with the choice of Roti (flatbread) or rice vermicelli. 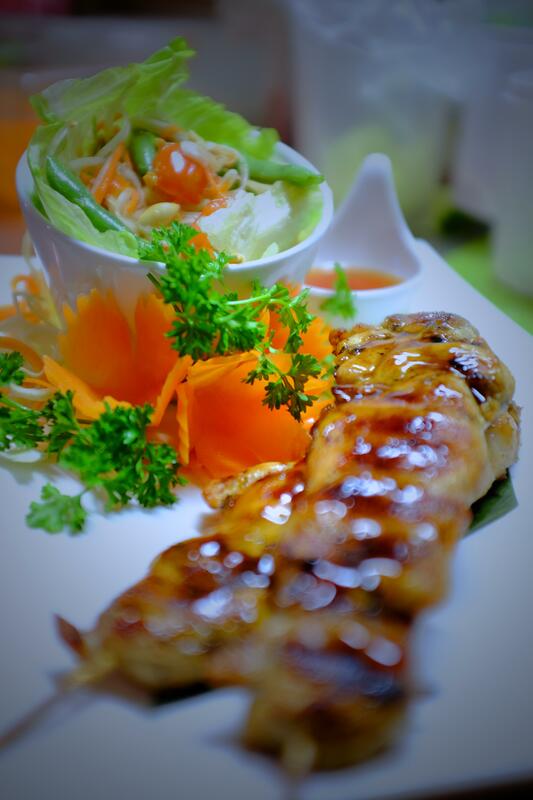 Marinated Chicken served with papaya salad and sticky rice. Sticky rice sweetened with coconut milk. Served with sliced ripe mango. A sweet, round, clear beads soaked sago mixed with black bean. Topped with coconut milk.